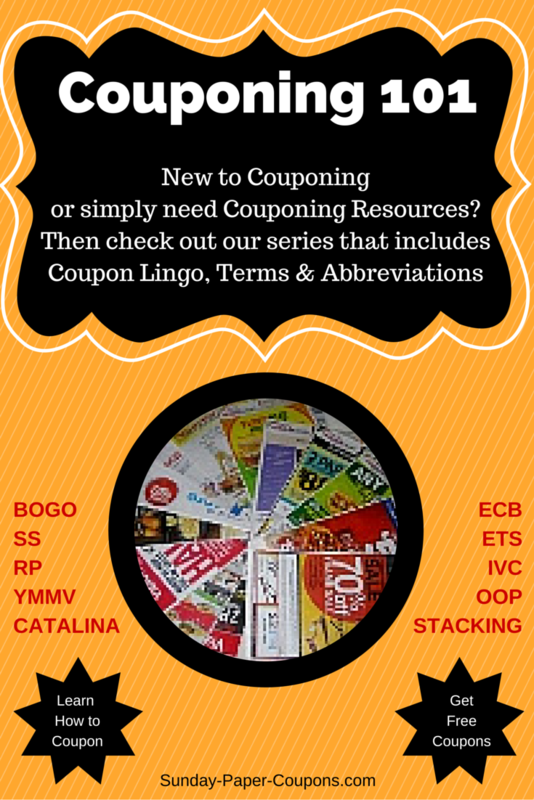 Coupon Lingo includes acronyms, terms and abbreviations for words that are used frequently by coupon shoppers. This lingo relates to couponing and shopping in general and is used by individuals, stores, websites, blogs, chat rooms and forums in order to save time and keystrokes when discussing coupon-related transactions and issues. I've provided a Coupon Lingo Quick Reference Guide that contains a list of Coupon Lingo that you will see on this site and other related sites, in stores and store ads, in blogs, chat rooms and forums. It’s a long list, but don’t feel overwhelmed, or feel that you have to learn this entire list, because you don’t have to! You won’t even need to use most of these abbreviations on a regular basis. You may see about one-quarter of these terms on a regular basis, (such as BOGO, SS, P&G, RP, UFT, ECB & RR...) and the rest of the coupon lingo will come up in spurts, so refer to this guide when and if you need to. $1.00/1, $2.00/5: For a Coupon this would read: One dollar off one item, or $2.00 off 5 items. Actual: Physical products (i.e., food) rather than just a coupon. B2G1: Buy Two items, Get One Free – means you buy two items and you’ll get the 3rd one free. Blinkies: Manufacturer coupons that can be found at stores in little boxes near products with red lights that blink. BOGO 50%/BOGO ½: Buy One Get One 50% Off, Buy One Get One Half Off – Both mean that you buy one at full price and you’ll get the other one at 50% off. BOGO/B1G1/B1G1F: Buy One Get One – means you buy one item and you’ll get the second item free. BTFE: Box Tops for Education – they offer coupons and also have special markings on products that schools can redeem for free or discounted products. B&M: Brick & Mortar – a physical store or location, not online. Catalina or Cat: A long white coupon that prints from a machine near the Cash Register after a purchase, and is handed to you along with your receipt. CLFE: Campbell’s Labels for Education – labels from products that schools redeem for free or discounted items. Coupon Insert: Coupon Inserts come out regularly in your Sunday Paper from Red Plum (RP), Smart Source(SS) and Proctor & Gamble(PG). CRT: Cash Register Tape – usually refer to CVS coupons that print at the bottom of your receipt for discounts on products or dollar off amounts on future purchases. DCRT: Dated/detailed Cash Register Tape. DCRTC: Dated/detailed Cash Register Tape with price Circled. Double Coupons: Some stores double the value of a manufacturer’s coupon, and some will only double up to a certain value/amount, or double coupons on certain days of the week. EB: Extra Bucks – CVS’ Rewards Program, also called Extra Care Bucks. These deals are offered in their weekly flyers. ECB: Extra Care Buck – CVS’ Rewards Program, now called Extra Bucks. These deals are offered in their weekly flyers. E-Coupons: Electronic coupons that can be loaded directly onto your Store Loyalty Card or Cell Phone. Envie: Envelope used for mailing items. ESR: EasySaver Rebate – the monthly Rebate booklet and program from Walgreens. FF: Firefox - when printing a coupon, sometimes you’ll see IE and FF. They’re asking you to select which browser you’re using, IE: Internet Explorer or FF: Firefox. Free Item Coupon-Gold! : Your product/item is absolutely free at the store, except possibly sales tax. HBA: The Health and Beauty Aid section of stores. HT: Hang Tags - refunds or coupons that are hanging on the neck of product bottles. IDSO: In Desperate Search Of – someone looking really hard for a particular product or coupon. IE: Internet Explorer – when printing a coupon, sometimes you’ll see IE and FF. They’re asking you to select which browser you’re using, IE: Internet Explorer or FF: Firefox. IP: Internet Printable Coupons that you can print from any computer. ISO: In Search Of - someone looking for a particular product or coupon. IVC: Instant Value Coupon found in Walgreens Ads and Monthly Booklets, and can be “stacked” with Manufacturer coupons. IVDSO: In Very Desperate Search Of – someone desperately needing to find a product or coupon.